If you are on U|K|Xubuntu 11.04 there is a better workaround were both right / middle click and multitouch works and works way better than this. 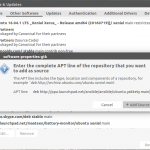 Although I don’t know if same would work on Ubuntu 10.10. One thing admire about Macbooks is their Multitouch enabled Touchpads which allows for advanced gestures like pinch to zoom, double tapping to right click, Two finger scroll etc. I recently bought a new laptop which did not ship with the traditional laptop touchpad but with something called a clickpad. Naturally this should mean that all the awesome gesture support I have always admired about Macs is finally available for my laptop? Well not Quite. Support the for clickpad on Ubuntu is still a bit flaky (to say the least). Not only are advanced features like enhanced gesture support and multitouch not available out of the box on Ubuntu. Other basic features like right clicking, horizontal scrolling, click and drag etc can be quite a hassle. On Ubuntu 10.04 some of the basic features have been fixed (although multitouch support is still lacking). Same thing can not be said of Ubuntu 10.10 because there was a regression which make it impossible to right click using the touchpad. Already a bug has been filled concerning the issue and I wrote about a work around which works quite well. It came yesterday when I stumbled on this bug report . Some (Awesome) dude created a package which brings basic Multitouch support for Clickpad on *buntu 10.10 . If everything goes well, Out of the box you should get basic multitouch goodness like two finger tapping to right click. To get more you have go a step further. should head over to Systemsettings > Input Devices > Touchpad Go to the “Scrolling” section and enable “Vertical Two Finger Scrolling” (There are other options there like “Horizontal Two Finger Scrolling” which I did not enable cause I am not really sure what it does, if you do please let me know how it goes :p) Then head over to the next Tab called “Tapping” what I did was to enable tabbing, then I went on to map Two fingers tapping to the Left click action menu and mapped three fingers tapping to the Middle key Again there are couple of options that can be set but I choose to limit myself by what I felt I needed. 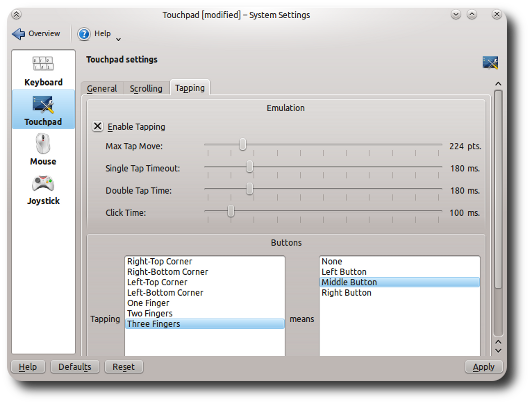 Go to System > Preferences > Mouse > Touchpad and select “Two-finger scrolling”. NB There are lots of configuration (at least on Kubuntu) I only enabled the ones which made sense to me and which I was certain I needed hence this should not be seen as a conclusive list of which gestures are supported. Reboot (not sure if that is necessary but its not bad to play it safe), and then install the Multitouch patch.